Rebel by chance. Traitor by choice. Gunslinger Amani al’Hiza fled her dead-end hometown on the back of a mythical horse with the mysterious foreigner Jin, seeking only her own freedom. Now she’s fighting to liberate the entire desert nation of Miraji from a bloodthirsty sultan who slew his own father to capture the throne. When Amani finds herself thrust into the epicenter of the regime—the Sultan’s palace—she’s determined to bring the tyrant down. Desperate to uncover the Sultan’s secrets by spying on his court, she tries to forget that Jin disappeared just as she was getting closest to him, and that she’s a prisoner of the enemy. But the longer she remains, the more she questions whether the Sultan is really the villain she’s been told he is, and who’s the real traitor to her sun-bleached, magic-filled homeland. Forget everything you thought you knew about Miraji, about the rebellion, about Djinn and Jin and the Blue-Eyed Bandit. In Traitor to the Throne, the only certainty is that everything will change. 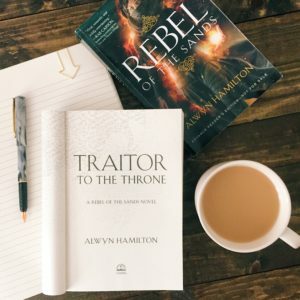 I read Rebel of the Sands and Traitor to the Throne back to back, but my review is for Traitor to the Throne. I was really looking forward to this sequel and was thankful I had it available after I finished Rebel of the Sands. While I enjoyed it, for the most part, I felt like it was lacking something. I really focus on the characters in books. 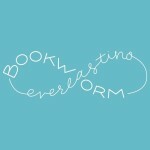 They are what makes or breaks a book for me, particularly the romance between characters. When that romance goes from wow, this is exciting, to basically nonexistent I was left scratching my head and disappointed! I don’t want to go into details of said characters because of spoilers, but I was not happy about this. Also, there was so much action in the first book that I anticipated even more in the sequel. I didn’t feel like there was enough, though there’s plenty of scheming going on in Traitor to the Throne. I definitely kept wondering who to trust, if there was anyone to trust, and who was lying. I would have preferred Amani’s gunslinging ways though. The world building and magic did make up for it though. I found myself engrossed in the world in Rebel of the Sands and Traitor to the Throne. If that’s what you enjoy in books I would highly recommend both books. I received this book in exchange for a honest review. This does not affect my opinion of the book in any way. Your photo is gorgeous! I’m glad you enjoyed this sequel so much. Reading the books back-to-back was smart! I read Rebel in January (or February?) of 2016 and it’s been a long wait. But hey, worth it, because Traitor was excellent. 😀 Wonderful review! I try to wait for all books in a series to be done, but sometimes you’re so excited to read a book that there is no waiting, lol. Great review! I absolutely loved the first book. I am so eager to read the sequel!! Thank you so much! I hope your enjoy it. I haven’t read the first book yet so I was scared to read this review, but I am really curious about this series! It’s really good. Even though I didn’t like the sequel as much they’re still good books.